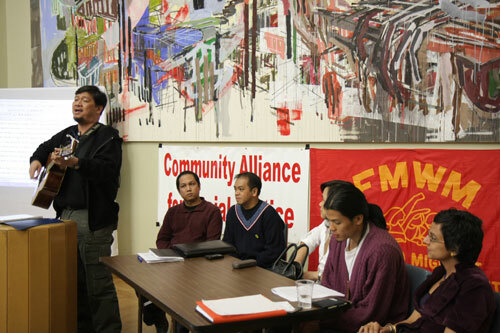 On Sunday April 4th, The Community Alliance for Social Justice (CASJ) and the Filipino Migrant Workers' Movement (FMWM-Migrante) held a panel discussion surrounding the findings of researcher Salimah Valiani's report titled "The Shift in Canadian Immigration Policy and Unheeded Lessons of the Live-in Caregiver Program". Members from the Filipino, labour and academic community gathered at Carr Hall on U of T's St. Michael College Campus to attend the event and pose various questions, comments and reactions to the panel and speaker on the topic presented. Salimah is a researcher, activist, writer and Doctoral candidate at Carleton University. Her report documents how the Live-In Caregiver Program (LCP) has become the template for new immigration policies favouring keeping the status of immigrant workers as temporary until various stringent requirements are fullfilled over an extended period of time within their stay in Canada. During her presentation, Salimah touched on the history of labour migration to Canada with particular focus on the LCP, citing how the inherently flawed program has been modified to favour and empower emlpoyers. In this manner, no heed is given to the immigrant's basic rights to be free from abuse from both employers and recruitment agencies, and the temporary status limits the worker's ability to upgrade their skills via training and education as international student fees are often restrictive in cost. These factors make it difficult for the LCP worker to obtain their landed status after fulfilling the various requirements of the program, and the statistics that Salimah presented in her report are compelling and as she explained, proved difficult to obtain. Salimah concluded her presentation by posing that the temporary foreign worker program that has been modeled after the LCP does not bode well for immigrant hopefuls to Canada and that changes to the system must be called for immediately. The panel comprised of members of the various Filipino labour advocacy and activist organizations, as well as a youth representative and an LCP worker. Each shared their thoughts and reactions to the report as well as updates on the various endeavours they are currently working on. Most recently of which was the demonstration held earlier that morning to protest the detention of hundreds of factory workers (some of which are Filipino) who picked up at a raid by immigration officials the week before. Reactions from the audience included views from an agency recruiter, a settlement services agency head as well as LCP workers.